There are students in the building. Not MY students, but students. My district brings the 7th grade students into the school on the day before the 8th graders to help them get acquainted and give them a bit of ownership of their new surroundings. The transition from Elementary to Middle School can be quite scary, so I think this is a great idea. I also think it's a great idea because it gives me another day to get ready. I will probably waste it. I am not ready for this school year. My room is not ready, my lessons are not ready and my mind is not ready. I had an amazing summer of professional and personal development! I drove to and from Jenks, Oklahoma with some amazing people to attend, and present at, Twitter Math Camp. I spend a week in Philadelphia with some amazing people as an EnCOMPASS Fellow, working with the Math Forum at Drexel University on student feedback software. 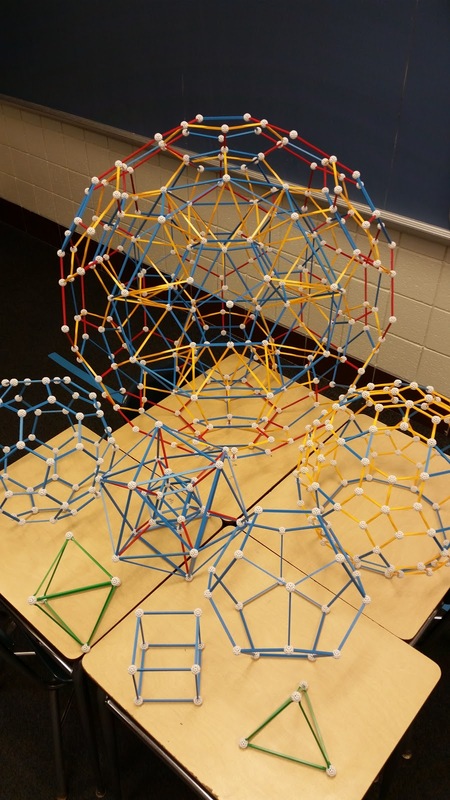 I spent Monday nights moderating #MSMathChat on Twitter. 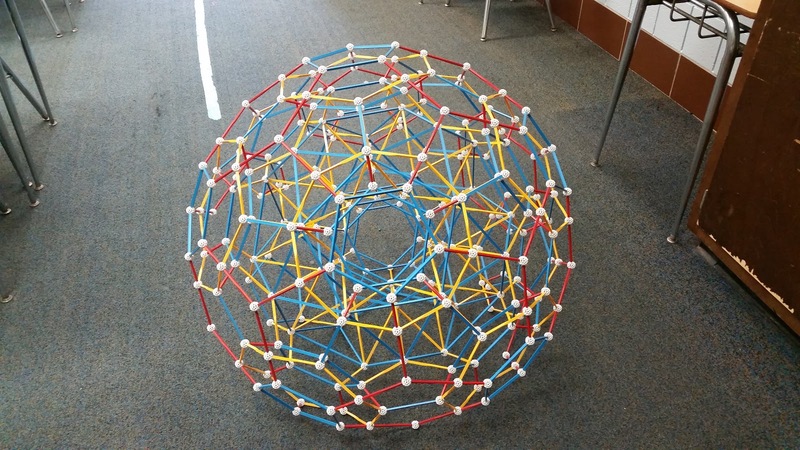 I spent countless hours having incredible conversations with teachers from around the world on the nature of mathematics, educational philosophy and strategy and how to implement those in a classroom of math-averse teenagers. I did everything I could do to pump myself up and be excited for this coming year. The Beginning Of The Year paperwork is horribly overwhelming and, in addition to the new district initiatives and observational "look-fors," I have been spending the last week with my fingers in my ears, eyes shut and rocking back and forth denying the inevitable passage of time as it counts down to the start of homeroom tomorrow. I know how terrible of a strategy and coping mechanism this is, but why put off until tomorrow what you can put off until the day after? 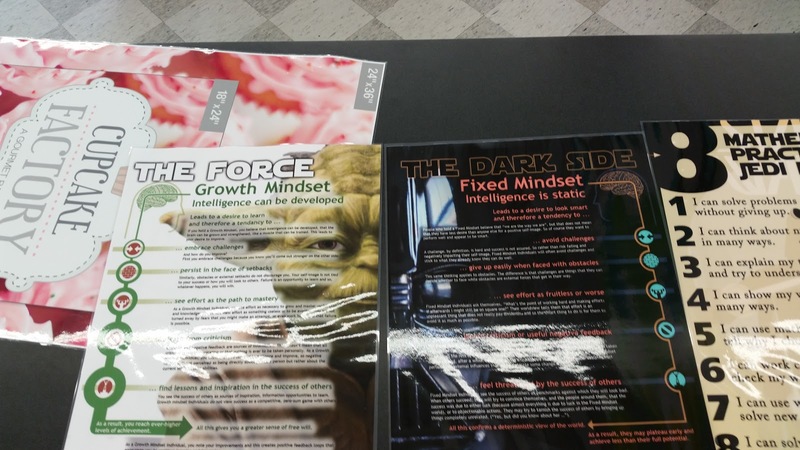 I put up a few posters that deal with fixed and growth mindset. I hung a few that deal with SBG that I'll be attempting this year as well as the 8 Standards of Mathematical Practice in student-friendly terms. You should check out @TeacherPaulP and the amazing design work he did on these. I put up a motivational poster that I found that deals with destiny as a choice. I have left most of my walls blank, telling myself that I want my students to fill them with their work. This is mostly true. I do want to fill my walls with student work, but I also am super sick of fighting with the walls. It takes an act of god to get stuff to stick to them. The posters I hung on Friday are already falling off. I could plaster everything in duct tape, but that looks awful. I may end up doing what I did last year: lining the walls with duct tape strips and taping things to that. 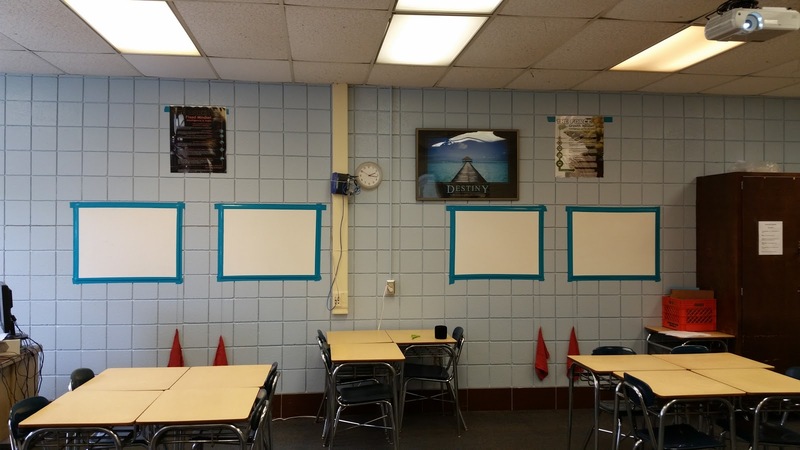 I taped dray erase boards to the wall for student use. I've moved my desks in the groups that we will be using from the start of the year. I printed my Remind Invite papers and course syllabi. Then I spent 5 hours putting together various objects using Zome Tools. I do not like the start of the year. I don't like re-establishing my expectations for a new group of students. I set the bar so high for myself last year with this blog, and my drawings and my innovative lessons and discussions, I'm terrified that I won't be able to improve, or even keep status quo. I exhausted myself last year and the prospect of doing it again is daunting. I've already decided that I won't be doing daily drawings again, but I will be keeping up with the blog. For the first time in my career, students are excited to be in my class. One of my students spent the summer harassing another teacher until she was promised that she would be in my class. I don't know if I can live up to the expectations that I set for myself and still manage to keep my head on straight. I am deeply worried that my students, the geometry students specifically, will be expecting miracles from me that I won't be able to deliver. Consciously, I know that I'm not a miracle worker. I know that if I do the best that I can do, everything will be great. I know that they will give me a certain latitude, imagining that my mistakes are simply clever ruses to get them to do something else. I am terrified of letting my students down. My pre-algebra classes are about twice the size they should be in order for me to provide the kind of intimate, individualized instruction that those students require. I need to find a way to create that environment in a room where students will be shoulder to shoulder. Since they will already be in groups, I'm thinking that stations will work, if I can get them up and running. In addition to all of this, I have to stop on my way home to buy some pasta for class tomorrow and some work shirts that aren't horribly stained in the front. I'm planning to, once again, do the Marshmallow Challenge using the format that Sarah Hagan uses because she rocks. On a totally unrelated note, does anyone know how to get grease and oil stains out of a shirt? Get a bar of cheap-o soap (Dial, Irish Spring... something w/o moisturizers). Use it like a stain stick. It'll get out a lot of grease and stains, but may take a few applications/scrubbings to do so. Moisturizers are code for "oil," which will lock stains (often greasy) in, rather than take them out. Chemistry wins again! I use dawn dish detergent to get out grease and oil stains. It works great!! Have a great year! I enjoy reading your blog. If you get a hot glue gun and use that to put up posters they stay put all year! It does not peel the paint or damage the walls. Give it a try. I have complete confidence that you will have an awesome year. Good Luck. Thanks for the suggestion! My posters are laminated. Will that be a problem for the hot glue gun? Really appreciate your self-awareness and honesty about beginning-of-year fears. You will be ready...keep on doing the best you can! Thank you so much! I'm so glad to hear that. I will say that self-awareness is a double edged sword. 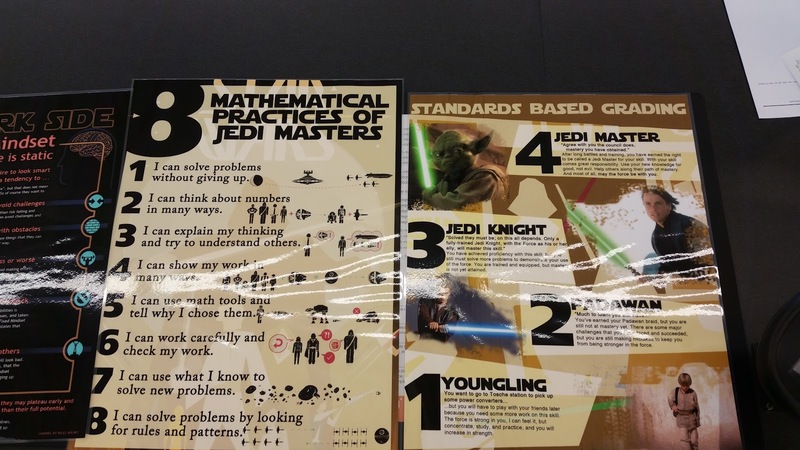 Love your "kid-friendly" wording for the Standards of Mathematical Practice poster! I am going to use this for my own classroom. Justin, love this. After 5 years out of the Jr. High classroom (7th grade) I am back in this year teaching a demonstration classroom in 3rd grade. I've been our district elementary math specialist for 4 years and I've been teaching teachers all about how to do math this way, but now I'm putting that theory into practice. I have to do this, but I'm in day 7 with students and I'm up and down with my emotions. Your day 1 blog really matches how I'm feeling tonight. Thanks for sharing. I'm so glad to hear that! I think that too often, teachers are afraid to share their emotions about this stuff because of how it will make us look. It's a huge problem for our profession and one I hope we can fix.